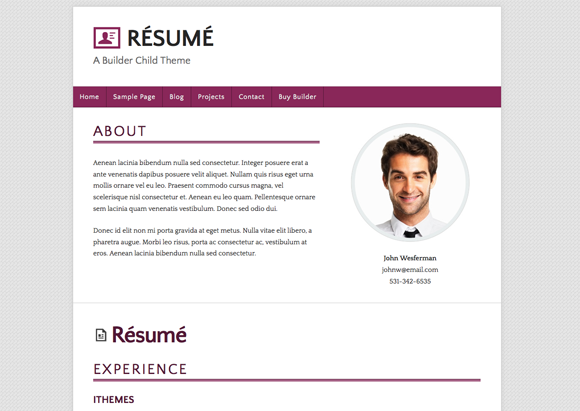 Check out Résumé, a Builder theme designed for those seeking employment. Résumé features 3 color versions, and is the perfect theme to accompany you on your search for a new career! This theme is powered by Builder. Builder's layout engine lets you create layouts and widget areas exactly the way you want. Builder themes (like this one) handle the design, typography, colors, spacing and overall style . And if you change to a different theme in the future, you can keep the layout, views and widgets from your site. Plus, you can use Builder's style manager plugin to make tweaks to your child theme without digging into code. If you have any questions about your Builder theme after your purchase, you've got a couple of great options. Post your issue to our Support Forum, or browse around the Codex for documentation and tips. Or for simple account or upgrade questions, contact us using this form.